American Kestrel. Field Sketch by Ken Januski. Each spring I tell myself that I'll do more field sketching and each year I seem to fail to do so. But seven field sketches yesterday and a few earlier in the week are a good omen for this year. The seven sketches yesterday were made easier by the fact that I had my scope with me and that most of the birds stayed in one place at least for a second or two. 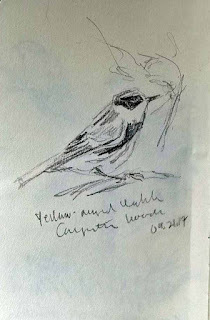 The last sketch of a Yellow-rumped Warbler shows what happens in other circumstances, for instance when it never sits still. I have had my scope with me recently when I've seen Yellow-rumps but it's been of little use. The birds move too fast to give me time to even get them in focus in the scope before they're gone. Above is a male American Kestrel and below a male Eastern Bluebird. 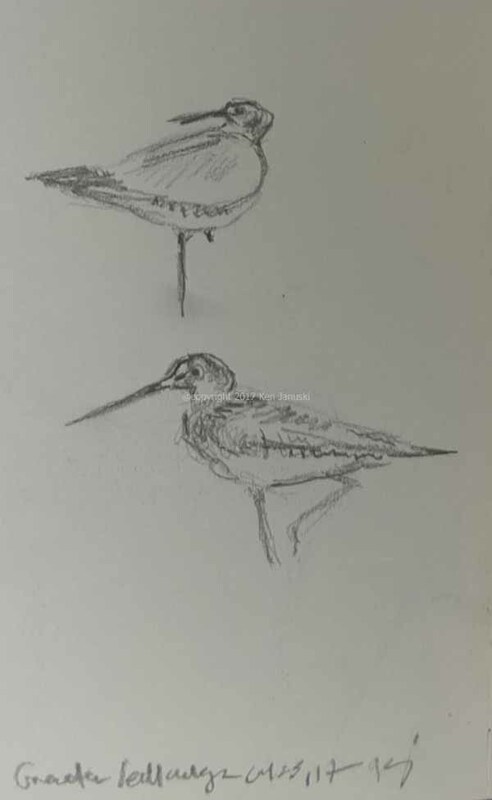 Both were sketched at Dixon Meadow Preserve. Eastern Bluebird. Field Sketch by Ken Januski. I didn't have any problem with movement in the larger drawing below. I'd been eyeing the broken, but still magisterial, leaves of this garden tulip for a week or more. There was something so sculptural about it. 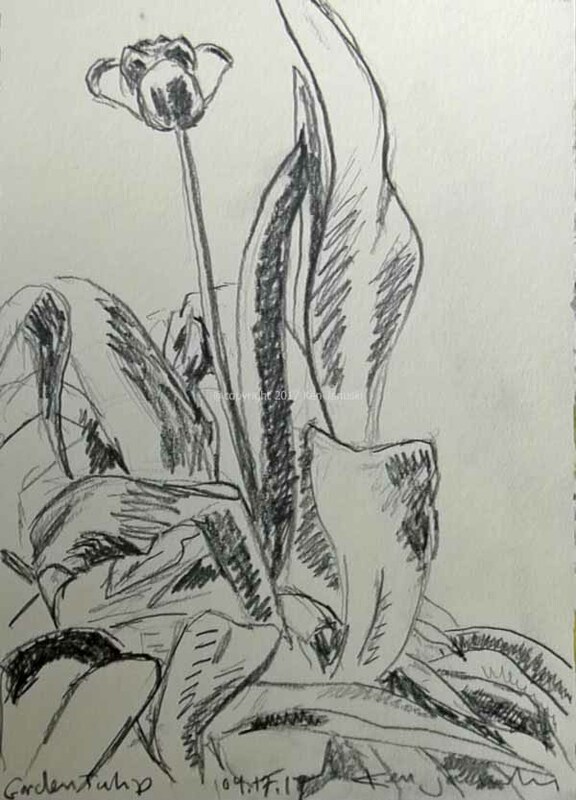 So I sat at our small garden table and spent one morning sketching it last week. I'm quite happy with it and it reminds me how powerful pencil on paper can be, without any need at all for color or fine detail. Storm-battered Garden Tulip. Field Sketch by Ken Januski. Yesterday I brought my scope with me to Morris Arboretum, hoping to see some migrating shorebirds. But no luck. Then as I was training the scope on an Orchard Oriole some friends came up to tell me an unidentified shorebird had just landed. 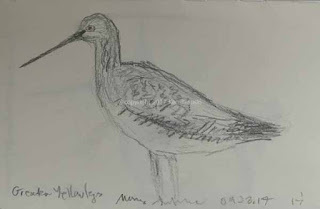 Sure enough there was a Greater Yellowlegs, the first I've seen this year. So I took the opportunity to keep doing sketches of it, four or five of them over an hour. 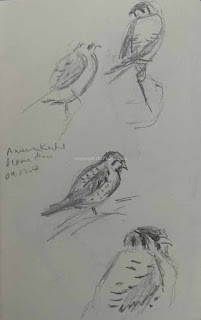 With field sketching I often find that I tend to stop after one sketch, unless it's a bird I've never seen before. I think this is due to fear more than anything else. If I've done one sketch I'm happy with why risk failing on the next one? It's a dumb way to think but one that still applies. Much better is to realize it's a rare opportunity and just keep sketching until the bird flies away. So that's exactly what I did. With sketching I think you soon realize that there is always more to learn, if not about the subject itself, then about the art of rendering the subject and the scene. 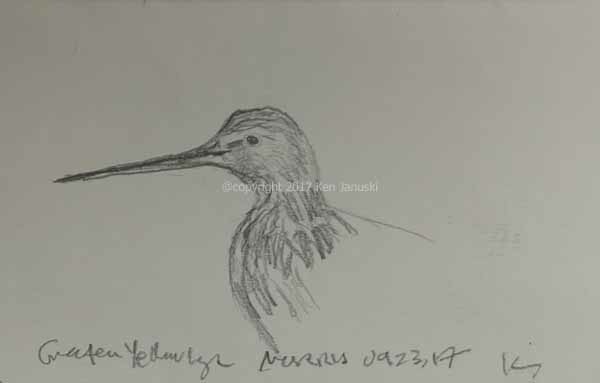 Greater Yellowlegs. Field Sketch by Ken Januski. Savannah Sparrow. Field Sketch by Ken Januski. 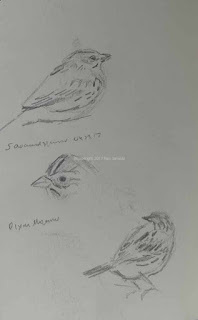 Above is another page of sketches from Dixon Meadow Preserve yesterday. It shows a Savannah Sparrow, the first I've seen this year. Below is a drawing of a Yellow-rumped Warbler, not drawn through a scope. The reason is that the bird wouldn't begin to sit still, as is true of many birds, especially warblers. So in the end you just have to look and look, try to form a mental image and then stop looking and try to get that image down on paper. Inevitably you realize that your mental image has faded too quickly. So you keep practicing. I think that's the only way to do it. And it does become satisfying as you get better at it. Yellow-rumped Warbler. Field Sketch by Ken Januski. 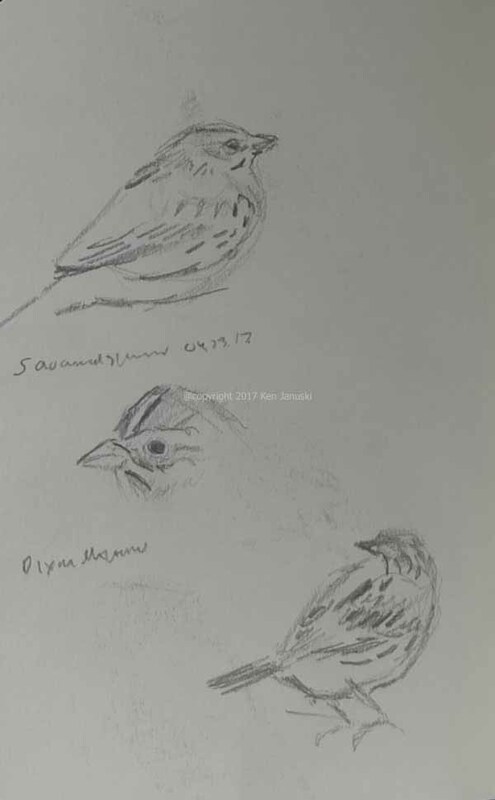 When I did the sketch of the Yellow-rumped Warbler I also shot a video on my camera of the same bird. It seemed worthwhile to show it as well. 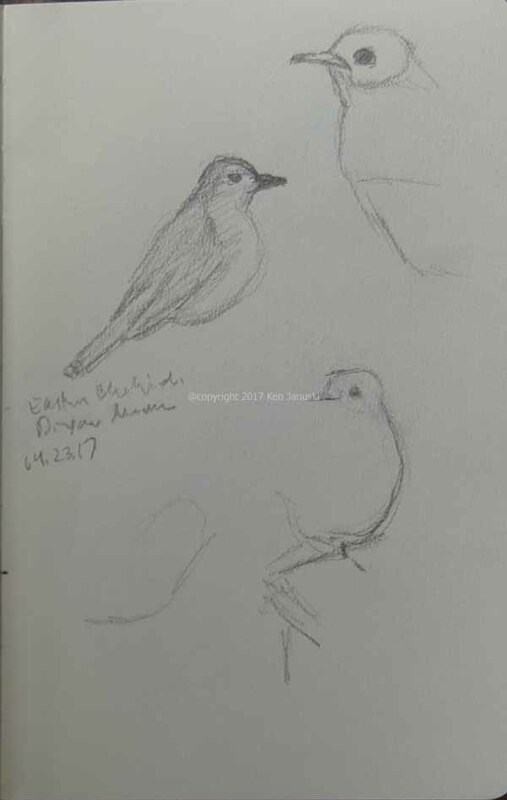 I think it shows why sketching warblers is so hard. I enjoyed that one so much that I took a few more yesterday. I'm including below ones of both a Blue-headed Vireo and an Orchard Oriole. The oriole sings toward the end but unfortunately the vireo does not.